← Progress in removing religious instruction from public schools? Irresponsible and misleading reporting of scientific issues always annoys me. But I have been particularly annoyed with the recent headlines of the sort “Now it looks like we’re in for an ice-age.” Here reporters have taken it on themselves to naively extrapolate research on the modelling of solar cycles to predictions about climate. Without considering any of the whole complex of inputs into climate change. I would have thought with all the controversy, and political and scientific discussion, about climate change over the last few years, that even the most junior reporter would recognise this complexity. That they would not make such naive extrapolations. And, particularly, they would completely ignore the role of the major recent inputs into climate change – anthropogenic atmospheric carbon dioxide. The research sparking the media reports was published last year – Sheperd et al., (2014). Prediction of Solar Activity from Solar Background Magnetic Field Variations in Cycles 21-23. This paper does not talk about climate – in fact, it doesn’t even include the word temperature. Nor did the Royal Astronomical Society press release referring to this modelling work (see Irregular heartbeat of the Sun driven by double dynamo). Better still – the figure above is from Skeptical Science – using data from Feulner & Rahmstorf (2010). 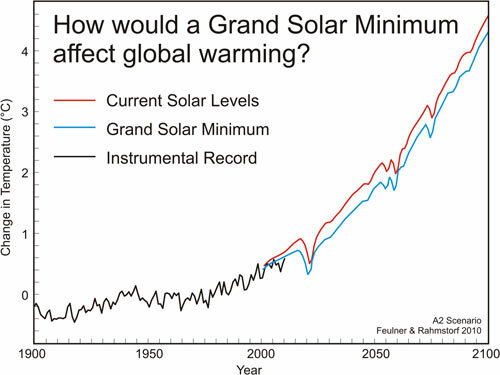 This shows the predicted future temperature of the earth modelled using current solar levels and the grand solar minimum of the sort predicted by Sheperd et al., (2014). Media Reports The World Will Enter A ‘Mini Ice Age’ In The 2030s. The Reverse Is True. This entry was posted in climate, environment, SciBlogs, science, Science and Society and tagged climate change, global warming, mini ice age, SciBlogs. Bookmark the permalink.